I decided to stay longer in Guadalajara than I’d planned (this always seems to happen to me). I mean, what the hell. The little town of Tequila was nearby and that, it seemed to me, necessitated a bit of a tequila pilgrimage. Which I began at La Fuente, a rustic, smoky cantina in Guadalajara’s historic district where I could appreciate both mariachi music and tequila at the same time since you really cannot (or should not) separate one from the other. And La Fuente, a serious drinking establishment not far from the Plaza de los Mariachis, was the perfect place to begin my pilgrimage because it is here, on most evenings, that you will find dozens of musicians in their charro-inspired finery of embroidered felt hats and high-waisted jackets entertaining strolling Tapatíos, as the locals call themselves, alternately celebrating and lamenting love, death, family, Mexico, and the company of a good horse. (There is something very bi-polar about mariachi music, what with a high-spirited number immediately followed by a weepy ballad, but that’s a story for another day.). Jose Delores. Photo by David Lansing. It was at La Fuente, while sampling a number of fine tequilas, that I met Jose Delores, a somber-looking man with sorrowful eyes who is the leader of a mariachi band from nearby Atotonilco. 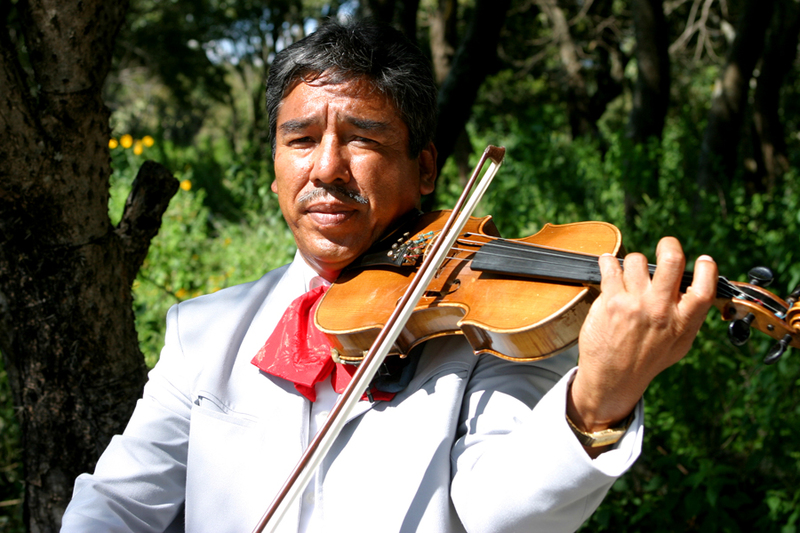 I invited Señor Delores, a violinist, to join me for a drink and then asked him if he thought there was an emotional connection between mariachi music and tequila. He looked at me thoughtfully for a moment, then slowly lifted his caballito, a tall, hand-blown shot glass designed specifically for sipping tequila, and took a small sip. “Sí, claro,” he said, studying the amber liquid. He placed the caballito back on the table and looked at me impassively. Clearly Señor Delores was a man of few words. “Sí, claro,” I told him. But I really didn’t. At least not yet. But that was okay. After all, this was just the start of my pilgrimage. I had many more cantinas to visit. My friends the Fletchers have invited me to spend the long weekend at their home, Casa Corona del Mar, in Custodio along what’s called the Nayarit Riviera. This necessitates a two day drive with a stop in Guadalajara (okay, I could do the whole thing in one long 10 or 11 hour drive but that’s not going to happen). 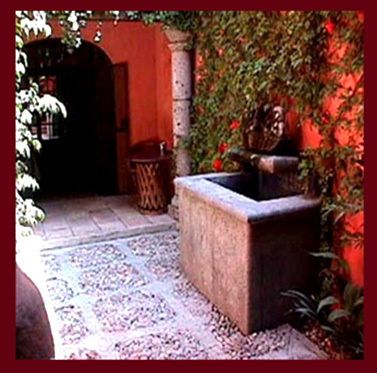 Whenever I’m in Guadalajara, I stay at the Villa Ganz, a stylish boutique hotel in an elegant old residential neighborhood full of coffeehouses and bookstores. There are a lot of reasons to love the Villa Ganz, not the least of which is Cecilia Blanquel, the manager. Whenever I mention an interest in anything having to do with the city, from where to find a rare tequila to the best place to purchase an olla pot for making Mexican coffee, Cecilia has the answer. So when I casually wondered aloud shortly after arriving where I might find chiles en nogada, it didn’t surprise me that Cecilia had a ready reply: El Sacromonte. Then she told me how to get there. Aye-yi-yi. So off I went, up one street and down another, strolling in the warm fall night along sidewalks covered in fallen jacaranda blossoms, making a left just past the old woman selling dried shrimp, as Cecilia had directed, and right on the corner with the street vendor selling churros, in search of a small restaurant in the former home of a famous Tapatíos bull fighter. What could be simpler? When I’m in Mexico, I love going to the little roadside birria joints throughout the central plateau of Mexico and slurping up every last morsel of slow-baked lamb in a spicy chile broth or hitting the mercado in search of the banana-leaf-wrapped pork tamales that are a specialty of Mérida. But the holy grail of Mexican cuisine for me is chiles en nogada. 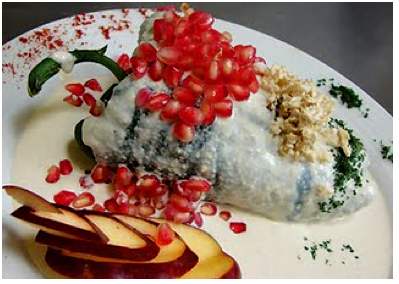 The colors of the Mexican flag are replicated in chiles en nogada. Chiles en nogada (chiles in walnut sauce) has a long and glorious history in Mexico. Legend has it that, around 1820, nuns from a convent in Puebla, in Mexico’s heartland, first prepared the dish at a banquet in honor of Mexico’s revolutionary leader, Agustín Iturbide, as he passed through the city after having signed the treaty with Spain that gave Mexico its independence. The story says that all of the dishes displayed the colors of Mexico’s national flag but the most memorable was the nuns’ creation combining the green of poblano peppers with the white of the walnut sauce and the red of the pomegranate seeds sprinkled over it. True or not, it makes a fine story. But I think the legend of the dish owes more to its scarcity (traditionally its only served between mid-August and Christmas, when both fresh walnuts and pomegranates are in season) and the elusiveness of finding one that is well made. Seen on a plate, chiles en nogada looks deceptively simple: There’s the ubiquitous Mexican chile (a mild poblano in this case, roasted and stuffed) bathed in a bone-white walnut sauce and adorned with jewel-like pomegranate seeds. What’s the big fuss? But like a chocolate soufflé, the art is in the preparation. First there is the filing or picadillo. It should be made from braised pork—not beef—and candied barrel cactus and the shaggy Mexican cinnamon called canela. To make the sauce you must buy fresh walnuts, like those sold in the fall by the old women along the streets bordering the markets in Puebla, and they should soak, overnight, in milk, and then be peeled (which is a horrible, almost impossible task) both to make the sauce as white as possible and to keep it from turning bitter. Most important is the balance of the ingredients: the filing must be savory but also sweet, the sauce delectable but not cloying. In short, each ingredient must complement but not overwhelm the other. Yes, and despite my lust for the dish, I am just about to give up on my expedition when I suddenly spot several well-dressed locals piling out of a car and disappearing behind the lush foliage of several jacaranda trees. “I’ll bet it’s over there,” I say to myself. And I am right. Minutes later I’m ushered to a linen-covered table in the rear of the open-air dining room, next to the trunk of one of the old trees whose purple-blue flowers disguised the entrance. I quickly dispense with the menu and order the house specialty, here called Los Chiles de Septiembre, in honor of Mexico’s Independence Day, September 16. As Cecilia predicted, I am not disappointed. The picadillo is meaty with overtones of candied fruit, the sauce sweetly nutty, and the artistic presentation of the red pomegranate seeds on the canvas of white sauce as beautiful as a Frida Kahlo painting. On the walk back to the hotel, I think about each ingredient, how the sweet and the pungent are a perfect marriage that could never have been predicted, and wonder if anyone else in the city makes a dish so fine. The next morning I thank Cecilia profusely for her recommendation, telling her I can’t imagine having a finer dish while in Guadalajara. “Is it far from here?” I ask her. And then she explains how to find it. But that is another story. So Monday afternoon I was lounging around the Starlight Lounge, the outdoor living room on the roof of my B &B, Casa Luna Pila Seca, just starting to doze off when my afternoon siesta was interrupted by the arrival of a young girl, maybe 11 or 12 years old, who didn’t think twice about throwing herself onto my lounging area even though there was plenty of room elsewhere. As I said, she was toting a copy of J.D. Salinger’s short story collection, Nine Stories. I moved my feet away from her when she sat down but continued reading my book. “So what do they call you?” she said. What do they call me? I don’t think anyone has ever asked me that question. It sounds like something you’d hear in a John Ford Western, right? “Mi nombre es David,” I said without looking up, hoping the Spanish would discourage any further conversation. “Oh, I get it,” she said, hopping up and going over to the honor bar. “We’re going to do the hable español thing, are we?” She reached into the little fridge and pulled out a Sol. “Want one?” she asked. Okay, I had to laugh. First she wants to know what they call me and then she wants to know how long I’ve been in town? Was she going to ask me about my horse next? “And where is that?” I asked. I didn’t, but I could see where she was coming from. “So what do they call you?” I said. I nodded. “You like that book?” I asked her. “This book?” she asked, holding up the Salinger as if it had just fallen into her lap. “Yeah, it’s okay.” She opened it up and started reading out loud. “”Here comes a wave,” Sybil said nervously. “Do you know who Zooey Deschanel was named after?” I asked her. “Yeah, well, my mom says I didn’t miss much.” The girl got up, went back to the honor bar and pulled out the Sol again. “Sure you don’t want one?” she said. “I’ll split it with you,” I said. She popped off the top and brought the beer over along with two glasses. I poured her about an inch and handed it to her. “Well that’s kind of cheesy,” she said. She took the glass and took a sip. “Yuck,” she said. “Well I hope I don’t acquire it,” she said. Then she grabbed her book and headed for the stairs. “Nice talking to you, Zooey,” I said. With that she turned away, lightly dancing down the stairs. Yesterday was one of those Mexican afternoons when it is just too warm to do anything. So I took a book, Chronicle of a Death Foretold, which seems just right for San Miguel (“The brothers were brought up to be men. The girls were brought up to be married. They knew how to do screen embroidery, sew by machine, weave bone lace, wash and iron, make artificial flowers and fancy candy, and write engagement announcements… my mother thought there were no better-reared daughters. ‘They’re perfect,’ she was frequently heard to say. ‘Any man will be happy with them because they’ve been raised to suffer.’”) and climbed up to the Starlight Lounge, the cool outdoor living room on the roof of Casa Luna. I love the Starlight Lounge with its long concrete bench decorated with green cushions along one of the walls and the strings of tin stars—estrellas—hanging from the roof beams. Dianne has an honor bar up here so you can grab a Negra Modelo or a Fanta if you want. Someone before me had poured themselves a glass of Mexican white wine but it had not agreed with them. Or perhaps, after they’d already poured it, they found it too hot to drink wine. A few small black bugs, buzzing around inebriated near the rim of the glass, seemed to be enjoying it just fine. I’d been up there for about an hour and had almost drifted off to sleep when a young girl came bounding up the steps and plopped down on the end of the bench opposite from where I was spread out. “Hi,” she said. She was carrying a black notebook and a copy of Salinger’s short story collection, Nine Stories, which just happens to be one of my favorite books in the world. When I was a sophomore in college, I took a creative writing class. I don’t remember the instructor’s name. He wasn’t much younger than us, maybe 25 or 26, and I don’t know what qualified him to be teaching fiction writing except that I think he had some connection to Ken Kesey, who lived nearby, and it was generally accepted back then that if you were friends with Ken Kesey, you were probably okay. Anyway, what I remember about this teacher, other than the fact that he was buds with Kesey, was that on the first day of class, all he did was sit behind his desk and read aloud a short story by J.D. Salinger called “A Perfect Day for Bananafish.” I am sorry to say that at that point in my life, the only Salinger I’d read was The Catcher in the Rye, but I knew for certain the minute our young instructor finished reading that short story that I was never going to go to law school as I’d always assumed I would. Of course, everyone raised their hand, including me. He nodded in appreciation. Still, I keep trying. Though I haven’t necessarily given up on being a high-flying trapeze artist. I’ll tell you about my conversation with the young girl reading Salinger tomorrow. 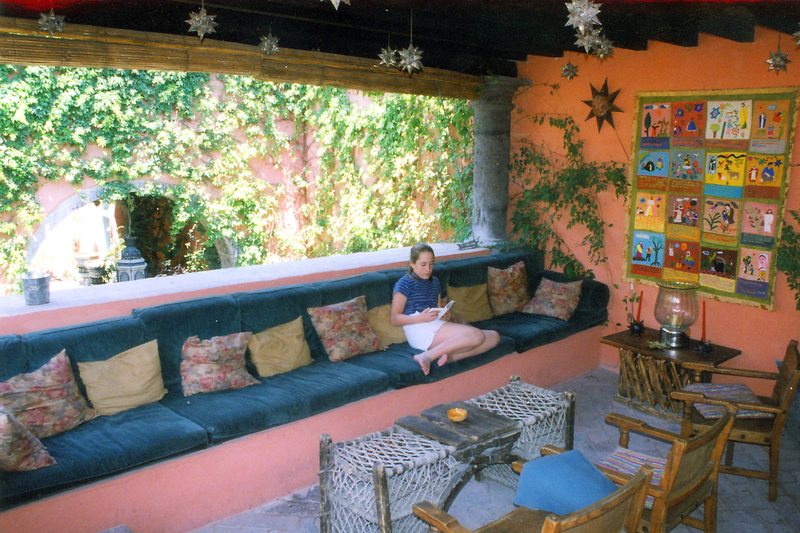 When I first rented my little house on Aldama I wondered if perhaps a month wasn’t too long. Now I realize it was not nearly long enough. And I am not ready to leave San Miguel. So over the weekend I have moved into a magical little B&B called Casa Luna Pila Seca. When I arrived Saturday morning, the owner, Dianne Kushner, was in Guanajuato for the day, having left instructions with Basi, the maid, to put me in Escondido—the “hidden” room, which is tucked into the back corner of the courtyard and where I have my own fountain lined with blue tiles and topped with a stone carving of a woman rowing a lion in a canoe. Outside my "hidden" room at Casa Luna. Escondido has saffron-colored walls, paver tile floors, and a brick ceiling. Across from my bed is a small fireplace and in the hearth, in place of firewood, four votive candles. An embroidered wall hanging made by Chichimecas women in the impoverished pueblitos near Guanajuato hangs over the fireplace. There are nine panels—like individual retablos—each telling a little story and giving thanks to the Virgin. Gracias Santicima Virgen por aber zanado a mi esposo que se troncho un pie. El 23 de Abril del año 1997—Sabina. Thanks to the Virgin for curing her husband’s foot. In the afternoon, I walk down to El Tecolote (The Owl), a bookstore on Calle Jesús, to look for something new to read. I’ve been reading Loverboys by Ana Castillo, a collection of short stories, but it is not very good or perhaps it just isn’t what I was expecting. I pulled it from the Latin writers section at El Tecolote hoping to be immersed in tales of Mexico. “Seductive…full of infectious vigor,” the cover proclaimed. But what I got were stories about a bi-sexual Latina from Chicago. Since the bookstore buys used books, I brought in Elmore Leonard’s Cuba Libre which I’d finished several days ago. But they’re not interested. “No one wants hard cover books,” says the woman who owns the store. “Too hard to travel with, too hard to read in bed.” Besides, she’s never heard of Elmore Leonard. How can you own a bookstore and not know Elmore Leonard? Even in San Miguel. I tell her the book was a NY Times bestseller and got wonderful reviews. She sighs and takes it from my hand, turning it over from front to back several times as if it were a piece of fruit she was considering buying. Fine, she says. I’ll give you 25 pesos credit. About two dollars. For a book I paid $23 for. I don’t care. Frankly, I’d have given it to her for free. Just so her customers have something to choose from besides the row after row of John Grisham and Stephen King nonsense. Today Elmore Leonard, perhaps tomorrow F. Scott Fitzgerald. I’m sure she’s never heard of him either.